So much is happening in the world of Italy in the month of April and May. I have been there working, vacationing and taking notes. Not knowing when work and play stop and start, I am considering myself lucky. The dilemma is what to write about first. Do I write about the Saint Nicholas celebration in Bari, which happens again in December, or do I write about Saint Francis festival, the “Calendimaggio” in Assisi, which happens only in May? I have seen both celebrations in the same month, they are unforgettable historic folklorist events and I don’t want to lose the opportunity to spread the words. “Calendimaggio” festival happens every year on the first Thursday, Friday and Saturday of May to inaugurate the arrival of spring, greeting the rebirth of life, after winter hibernation and hardships. During the centuries many northern European cultures have celebrated the arrival of spring with flowers and colors. The Celts had two seasons in a year, the dark and the light season, the effect of spring did not come until the beginning of May. The Romans during the “Floralia” celebrated Maia and Flora, two goddesses of Spring. Groups of young gaudentes in flowery dresses decorated with flowers in the hair and all over their bodies, sang, danced and charmed the people in the streets with their serenades. During the Middle Age the newly adopted Gregorian calendar changed the name of the spring celebration to “Kalende di Maggio” (Calendar of May), but the objective was the same: to propitiate the abundance and good fortune at the beginning of the season transformation, when trees bloom and start producing fruits. This transformation of nature is the fundamental base of a better life. Good food means good health, which in turn means better spiritual life. Banquets, bonfires, songs and dances at the top of the hill celebrated the season transformation, while inevitably the so-called “honorable” citizens erupted in horseback fights. Bitter and hard conflicts between various factions were the reason for creating Saints, symbols and flags in most history of people and Assisi’s history is no different. Today, the show of the skilled flag wavers is magnetic. The colors of the flags are blue for secular authority and red for pontifical authority, both temporal and religious powers in the Middle Age. The spring celebration, a pagan custom, blends well with the religious celebration of Saint Francis, the patron of Italy, which happens simultaneously. Young Francesco (Francis) renounced his nobel and rich heritage, adopted a simple brown robe with a rope in the waist as his dress and served as the “poor of God” looking after the poor and sick people, spreading the Word of God. The beginning of the spring season today is celebrated much the same way with love songs, choral music and street dances accompanied by violins, guitars and lutes. There are competitions, games and events, without the bloodshed of the old Middle Age. Medieval processions and torch-lit parades will recapture the old charm. 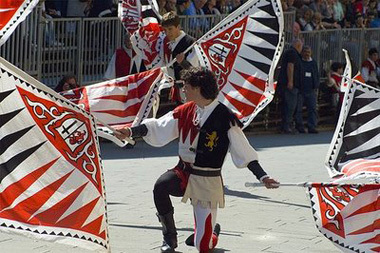 The festival leads to the prestigious Palio with two districts of the town of Assisi competing against each other for a valuable prize. The districts are the ‘Magnifica Parte de Sotto and the ‘Nobilissima Parte de Sopra’, meaning the Low and High Districts of Assisi. All of this fun and re-enactment of history happens while the aroma of the traditional porchetta and roast-suckling pig fills the air of the entire town. It was worth going out-of-the-way of my designated path while in Italy. I had never seen the city of Assisi overflowing with a kaleidoscope of colors, flowers, adorned trees, various symbols, statues, altars, religious figurines, flags and gonfalons, as in this three days of celebration of life, peace and food. 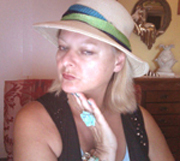 Valentina Cirasola is a trained Italian Interior Designer in business since 1990. Being Italian born and raised, Valentina’s design work has been influenced by Classicism and stylish, timeless designs. She will create your everyday living with a certain luxury without taking away your comfort. She loves to restore old homes, historic dwellings and she focuses on remodeling. She is interested in food in history studies and historical events.